Published today: Two science fiction short stories | Victor D. López, J.D., Esq. 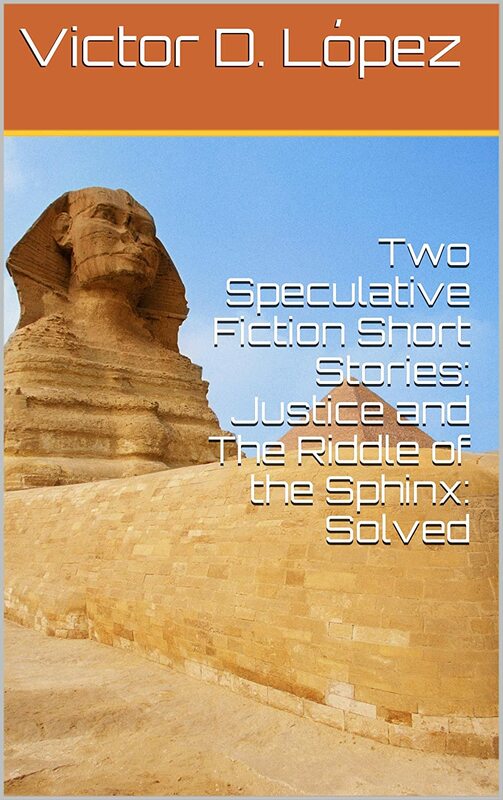 This is publication is a compilation of two speculative fiction short stories. In the first, “Justice”, a man is being tried for the last remaining capital offense in a kinder, gentler, truly unified world in the not to distant future. In the second, “Riddle of the Sphinx: Solved” The secrets of the Sphinx are finally revealed to a curious world in prime time by the world’s most famous Egyptologist in a live event reminiscent of the disastrous, much hyped opening of Al Capone’s vault by Geraldo Rivera in prime time some years back. No empty bottle will be found in the chamber beneath teh right paw of the Sphinx. No, not this time. Alas.